Temple O' Trunks - Updated 4/26/2008: New Trunks Scans! Like DragonBall? Like Meri? Wanna hear Meri talk about DragonBall with VegettoEX and Julian? Then check out Daizenshuu EX: The Podcast, your one and only DragonBall podcast! - It's both funny and sad at the same time that it's been nearly a year since the last content update to this site. Even more amusing is that this update is similiar to the last content update in that lots of large and awesome images have been added to the Trunks Scans page! This time around, I've posted 7 new scans from the 2007 Trunks Calendar, thus completing the set. Enjoy! - In other life news, I'm now engaged (to this guy here, in case you were wondering) to be married! Whoa! If you're not already listening to it, you should check out our shenanigans on our weekly DragonBall podcast. - I've got a lot of new anime music videos to add to this site, but I'll save that for my next update (along with most likely another batch of eBay items, including Trunks stuff!). Until then, please check out my animemusicvideos.org profile for all the recent videos I made in the last year. - Don't worry, an actual update is forthcoming. I've got a long weekend coming up, and lots of new items to post on the site, including 3 or 4 new AMVs, and more Trunks scans. But for now, please take advantage of the mind-blowing discount items I've posted on eBay! These items are going to up for auction until next Sunday. Included are 4 DBZ video games, 2 DBZ and 1 Trunks poster, and tons more stuff! Check it out! - Yay, it's an update. An update with TRUNKS content, no less! This is mad crazy important. Let me tell you why. The Trunks Scans section has 6 huge and gorgeous new images... and this is the first time this section has had a content update in FIVE YEARS. This update contains the first batch of images from the 2007 Trunks Calendar! Major thanks go out to Maggie from Lovely Cyborg, since she was the one who bought the calendar for me. :) Stay tuned in the coming weeks for the rest of the scans from the calendar. This is quite a treat, since there hasn't been anything new of Trunks for me to scan in eons. - Next up is a new Anime Music Video from me. It's a comedy trailer to the anime "Honey and Clover" using the audio trailer from the movie "Art School Confidential." You can download it here. Hope you like it! In addition to making a new 2007 page for my AMVs, I also did some clean-up work on the 2006 and 2005 pages. - Updated the ToT April Fools Day joke archive with the gag from this year. :) Check it out if you missed it. - Surely, you all must be saying "Meri, back with an update so soon?! What's the world coming to?!". And if you're not, well... maybe you should! That's right kiddie, there's been a crap-ton more goodies added to the ToT. Let's get right in to it, shall we? - First, as promised, here's a brand-new DBZ Music Video! It's a Gohan character profile video made by me and VegettoEX called "Succession," and it takes place during the Cell Games. The video premiered at Anime Weekend Atlanta 2006 this past September. It was nominated for "Best Character Profile" and "Best Sentimental" in the Pro contest. Not only is this video (encoded as XviD) available on my animemusicvideos.org profile, but there's also a direct download (compressed in a ZIP file) for those of you who may not have an account on the .org. So please, download away, and enjoy! - Next up, there are 60 new images added to the Trunks Screencaps section! 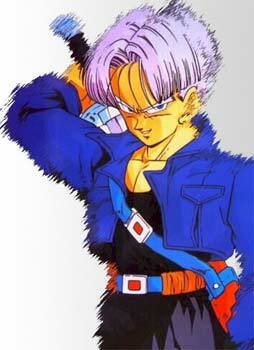 Today, we've got images of Chibi Trunks from DBZ Movie 13. Now, what makes this special, you ask? Well, these screencaps were taken from the anamorphic, widescreen, remastered Japanese DragonBox DVD release! What this means for you is crystal clear images that make it look like this movie was animated yesterday, as opposed to 11 years ago. O_O Yeah, they're hot. Check 'em out. - And finally, brining on the real hottness for today is an update to the Trunks Doujinshi section! This past weekend at the MangaNEXT convention, I picked up a Trunks doujinshi I've been vying for for about, oh, let's say 8 years or so. Now that I finally got my obsessive hands on it, I've scanned a few images from the book, and put 'em up on the site. Hopefully, I can scan even more pics from this soon. - Alrighty, so it's been a year since the last content update. And guess what.... here's a content update! One of several actually. First up, I've posted a year's-worth of new Anime Music Videos. These actually HAVE been available for download during the past year. I've just not added them to the ToT. So, if you don't follow animemusicvideos.org, you may not have seen these videos. If you are interested, please check them out! These videos are included on the 2005 and 2006 AMV pages on this site. Some of the animes included in these AMVs are: Kaleido Star, Kare Kano, Hajime no Ippo (if you like DBZ, you will LOVE this series), and much, much, more. Most exciting of all: expect a new DBZ video made by myself and VegettoEX to be posted online in the coming days! I'll also be posting a link to Reflections of Style 3, a multi-editor AMV project both VegettoEX and I participated in, once it becomes available online. And speaking of young Mr. VegettoEX, perhaps you've heard of Daizenshuu EX: The Podcast. This is a podcast related to anything and everything DragonBall. If you've been wondering what I've been up to the last year, well, that's it. I've been co-hosting this DBZ podcast with VegettoEX and Julian of Daizenshuu EX for the past year, and will continue to do so as long as they are willing to have me on the show. If you've not checked it out yet, please give it a listen! It's good (not so clean) fun! The Temple of the Almighty Purple Haired Wonder has had visits since March '98! The Temple O' Trunks has been selected by the Anime Web Turnpike as one of it's Weekly Web Picks for 5/7/01! Additionally, the ToT's very own Feature Films were also picked by the Anipike as a Weekly Web Picks for 9/27/99. Know what this means? It means that this site not only has something resembling credibility, but something resembling super-duper credibility! This site is best when viewed with Internet Explorer at 800 x 600, 1024 X 768 or higher.